A great place to begin to satisfy lofty ambitions is with the vegetables and fruits that naturally climb or can be made to do so with gentle encouragement. This includes the likes of pole beans, climbing peas, vine tomatoes and the cucurbits: cucumbers, melons, squashes, pumpkins, gourds and sprawling types of zucchini. If you're reading this in a warmer part of the world you can add sweet potatoes to this list. Most tree fruits such as apples and cherries can be trained into space-efficient shapes: vertical cordons, espaliers, fan shapes or any manner of creative but fence-hugging formations. Cane fruits like raspberries and blackberries grow naturally tall – the trick here is to keep them from flailing around onto their neighbors. Grow them hemmed in between rows of parallel wires or tie individual plants to vertical posts. Hanging about: As well as growing up from below, many climbing or sprawling edibles can be grown from above and left to hang down. Vine tomatoes are best for this and work well in 'upside-down' planters. Make a hole into a large bucket that's just big enough to allow you to plant up the tomato. The hole must also allow the stem to thicken as the plant grows. Plant the tomato, feeding compost around the rootball and fill to the top of the bucket. Sow or plant at the top shallow-rooters such as lettuce, radish, basil or stump-rooted carrots. Hang up then feed and water from above while the tomato erupts out from beneath. 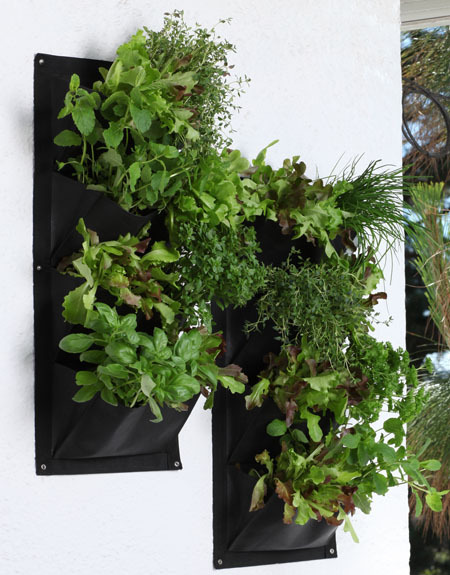 You can also grow strawberries and other fruiting veg such as peppers and eggplant in this way. The result is literally buckets of produce! Archway of delights: Visitors will immediately know you're a passionate grower of all things edible if you plant an edible archway leading up to your front door. Simply plant each archway support with its own climber and watch as over the growing season the archway is consumed by a lush jungle of foliage, pods and fruits. Squashes and beans with colored pods (try alternating purple and yellow-podded varieties such as 'Blauhilde' and 'Goldfield') look especially impressive given this treatment. The pods and fruits will dangle down above head height to create quite a visual impact. Beans with strongly coloured flowers such as the classic 'Scarlet Emperor' are as floriferous as the best of the traditional ornamental climbers – a feast for both the eyes and stomach.